The global cell expansion market is fairly consolidated with the top eight players accounting for most of the market share. Majority of the top players, with an aim of furthering their market share, are expending a lot of money and time on research and development in order to come up with new cell lines and applications. They are also focusing hard on product differentiation to bolster their positions. On account of this, competition is robust in the market for cell expansion. Providing tailwinds to the global cell expansion market is the growing prevalence of rare and chronic conditions and also the continued rise in demand for biopharmaceuticals. Growing demand for regenerative medicines that provide faster results and cell-based therapies that have high patient compatibility are also said to be stoking market growth. High cost involved in operations due to the need for skilled workforce and high tech instrumentation, however, is acting as a deterrent for the market. Strict rules and regulations pertaining to cell expansion processes owing to the ethical concerns surrounding it too is crimping market growth to an extent. However, despite all obstacles, the market will likely clock a robust CAGR of 14.7% between 2016 and 2024, finds a report by Transparency Market Research. Growing at this pace, the report predicts the market to attain a value of US$26 bn by 2024-end from US$7.737 bn in 2015. The global cell expansion market can be broadly divided into human stem cells, human differentiated cells, and animal cells based on the types of cells. Of them, the human stem cell segment accounts for a leading share in the market vis-à-vis revenue due of the increasing instances of various chronic diseases and support provided by the government. In 2016, it held a substantial 58.1% share in the overall revenue in the global cell expansion market. The animal cell segment, on the other hand, is also predicted to grow at an impressive 14.6% CAGR from 2016 to 2024 to become worth US$ 7,432.6 Mn by 2024 on the back of demand for development of vaccines against some parasitic and viral diseases. Geographically, the global cell expansion market can be segmented into Asia Pacific, Europe, North America, Latin America, and the Middle East and Africa. North America, of them, is the leading market. In 2016, it held a 39.3% share in the market. The regions dominant share is the result of a large number of prominent players domiciled there and the increasing spends on research and development in the area. In the years ahead, North America is predicted to trim its market share and by 2024 it is slated to hold 37.7% share. It will still retain its leading share, however by rising at a 14.7% CAGR during the period from 2016 to 2024. In terms of growth rate, Asia Pacific will expected to outpace all other regions by clock a stellar CAGR of 16.4% between 2016 and 2024. This is because of the key players keen on tapping into the opportunities in the emerging economies in the region such as India and China. Besides, growing number of market participants from the nations of Japan, Australia, India, and China is also majorly filliping the cell expansion market in Asia Pacific. The trend of outsourcing research processes to low cost destinations in Asia Pacific and the availability of expertise in the region has also been stoking growth. The report provides market size in terms of US$ Mn for each segment for the period from 2014 to 2024, considering the macro and micro environmental factors. 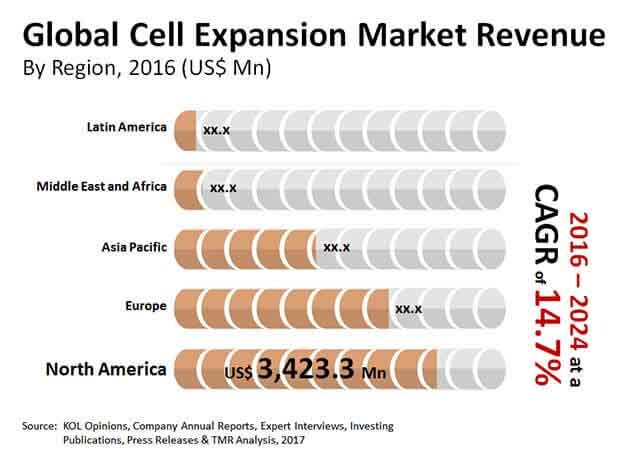 Growth rates for each segment within the global Cell Expansion market have been determined after a thorough analysis of past trends, demographics, future trends, technological developments, and regulatory requirements. A detailed qualitative analysis of factors responsible for driving and restraining market growth and future opportunities has been provided in the market overview section. This section of the report also includes market attractiveness analysis that provides a thorough analysis of the overall competitive scenario in the global cell expansion market. Market revenue in terms of US$ Mn for the period between 2014 and 2024 along with the compound annual growth rate (CAGR %) from 2016 to 2024 are provided for all the segments, considering 2015 as the base year. Market size estimations involved in-depth study of services and product features of different types of services. Additionally, market related factors such as increase in prevalence of cancer and rare diseases, rise in demand for regenerative and cell-based therapies and historical year-on-year growth have been taken into consideration while estimating the market size. The cell expansion market has segmented into four categories, namely by type of cells, by product, by end-user and by region. Geographically, the global Cell Expansion market has been segmented into five regions: North America, Europe, Asia Pacific, Latin America, and Middle East & Africa. In addition, the regions have been further segmented by major countries from each region. These include the U.S., Canada, the U.K., Germany, France, Italy, Spain, China, Japan, India, Saudi Arabia, UAE, Brazil, and Mexico. The report also profiles major players in the cell expansion market based on various attributes such as company overview, financial overview, SWOT analysis, key business strategies, product portfolio, and recent developments. Key companies profiled in the report include GE Healthcare, Danaher Corporation (Pall Corporation), Terumo Corporation, Merck Millipore (Merck KGaA), Octane Biotech, Inc., Thermo Fisher Scientific, Inc., Lonza Group, STEMCELL Technologies, Inc., Becton, Dickinson and Company, Bio-Techne (R&D Systems), Takara Bio, Inc., Cell Signaling Technology, Inc., PeproTech, CellGenix GmbH, Corning Incorporated, Eppendorf AG, and HiMedia Laboratories.